gringa.org: I have put this off long enough! I have put this off long enough! 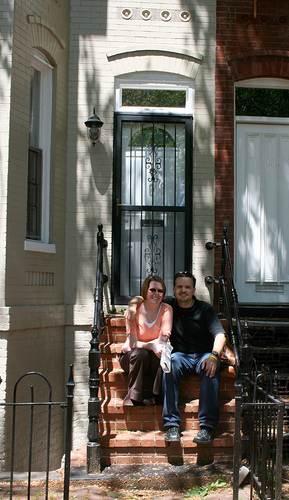 By this time next week, Jason and I will be moving all of our possessions into a sweet little row house we now own in Washington, DC. This is a very good move for us -- we'll be closer to family, he's got a great job, and my employment prospects are much improved simply by being in the nation's capitol. Our new place is in a neighborhood we love with friends nearby. We're excited, but also a tad overwhelmed with the moving, and a little sad, too. I've moved countless times since I graduated from college, and I've learned that every prospective move has happy parts and sad parts. If the happy parts generally outweigh the sad parts, it's a good move. On balance, this is one of the happiest moves I've ever made, but the sad parts are -- as always -- making me a little weepy. So why have I been avoiding this blog like the plague? Weepiness is not usually a deterrent to blogging for me. In this case, though, I think it's because many of the sad parts of this move are connected to knitting! I'm leaving some yarn stores I've grown to love (and some I've grown to just tolerate because of their outstanding inventory! ), and a knitting group that introduced me to the pleasures of knitting as a social activity. Above all, we'll be farther from the good friends we've made in Boston than we'd like, and no friends are harder to leave behind than Alison, her husband (and Jason's fellow tech guy! ), and, of course, their boys. So everytime I thought of blogging, I'd think of what knitting project I would write about and that would lead me to think about how much I'll miss the Boston yarns stores and Knitsmiths and Alison and the gang, and... I'd put it off. I'd bet the propensity for weepiness will increase between now and next week, so look for me to be back here telling you about my new LYS some time after that! Congrats on the house! Moving is always hard--but it makes visits so much nicer. Good luck with the move and I'm sure you'll find many new knitting friends in DC. But hey, cool rowhouse. More pictures perhaps? I was wondering where you'd gone. I was just thinking about you yesterday and then you magically appeared in my bloglines. Congrats to you and your hubby with your new house. Moving is always hard, but there are perks to both sides. Enjoy the new lifestyle and come back to visit often! Good luck on your move and job-hunting. Es bueno saber de tí. ¡Felicidades por tu nueva casa y mucha suerte con la mudanza! Deseo también que lo bueno de tu nueva vida te ayude a superar lo difícil.¡Un abrazo! Another knitter here who just moved to the DC area! I'm about to start exploring different knitting groups so I'm more than happy to share notes or be charge in there buddies! We have some lovely yarn stores down here as well, so don't worry! Yippie! We can go through first-time homeownership together. Congratulations sweeties! Congrats on the big move! Glad to see you posting again and looking forward to your reading of your new DC knitting adventures. My fiancé and I are in the process of planning our honeymoon to Southern Spain. Your pictures came up on google and they look beautiful. Do you have any advice or hotels that you would recommend? Also, how many days did you have? We have 10 days. Also, as it turns out, we are moving to D.C. in September after the honeymoon. We both just graduated from Duke Law and we will be attorneys. Congrats on your move shannon! So excited for you! House looks awesome. My best bud molly and I are knitting today and I wanted to show her your website to introduce her to the person that showed me how to knit!